It is easy to memorize scripture verses and it is just as easy to quote them to someone who needs to hear their message but it is another thing entirely believe in them when we are the ones in need. I am writing this morning’s Glory Seed from somewhere in a “darkest valley” and I find myself struggling with my own loss of direction desperately reaching out to Jesus the only one who can help me find my way to the promised “green meadows” and “peaceful streams”. There are times on my own faith journey when find myself wandering in a “darkest valley” and I ask myself, “Gary, how in the world did you get here in the first place?” And after wrestling with myself for a while I come to the conclusion that I honestly don’t know. However, I am not satisfied with that non-answer and so I ask the LORD for help. And this morning from deep inside one word keeps resurfacing in my thoughts “depression”. Could it be me, a Christian who depends totally on Jesus, a man who believes deeply in the words of the bible be depressed? According to the Apostle Peter the answer is yes it is possible, just because we have a relationship with Jesus does not make us impervious to the influences of everyday living. 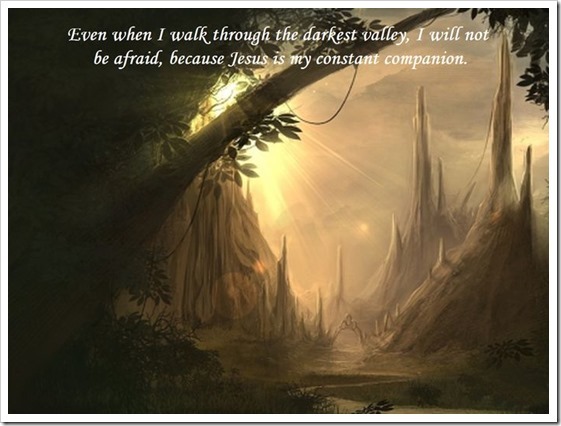 During Jesus’ darkest hour after all his friends deserted him he wasn’t alone! And because God was his constant companion he was at peace. During times in our “darkest valley” when it seems as if we’re alone we are not, Jesus through the Holy Spirit is our constant companion leading us to the promised “green meadows” and “peaceful streams”. And mine are now coming into view, thank you Jesus!